LOOKS yucky; tastes yummy. That is Indian Pudding in a nutshell. Today, is National Indian Pudding day and this little Thanksgiving-time dish deserves a few, sweet words. Like so much in life, it was a happy accident. Keep in mind that Indian Pudding is one thing the British colonists did not take from the natives, though the name may suggest it. Indian pudding was born when home cooks, lacking wheat flour, substituted corn flour, a New World staple back in that day. Eventually, the corn flour would be gussied up with molasses, ginger, cinnamon and other ingredients. These additions created a dessert, departing from the more savory porridge that it was intended to replicate. A happy accident! Sweet, no? Recipes for Indian pudding abound. The challenge set forth, however, was to root around the World Wide Web for one with few (five!) ingredients - the ingredient list for this little sweetie can be rather massive (as large as 15!). Success! The winner is an old James Beard recipe (below) that appears in Epicurious (http://www.epicurious.com/). See the video at top from The Culinary Institute of America and click on the link in the photo caption below to see more elaborate Indian pudding recipes. 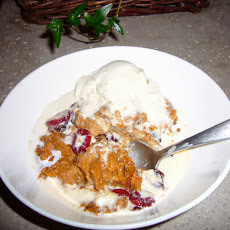 The recipe for Indian Pudding with Bourbon Spiked Cream is only a click away: http://www.bit.ly/17Uu9bs. Photo courtesy of Yummly. Put the scalded milk and corn meal in the top of a double boiler over boiling water. Add the salt and cook, stirring frequently for about 20 minutes. Mix with the molasses and ginger and pour into a buttered 2-quart soufflè dish or baking dish. Bake in a 300°F. oven for about 2 hours. Serve warm with vanilla ice cream.